Brad Pitt has always struck us as a very normal midwestern guy with few pretentions. Naturally a guy like that enjoys doing ordinary things – like browsing in the local hardware store. The Pitt family just settled into a huge 8 bedroom rented home in the UK in Surrey, and Brad must have some do it yourself projects to take care of. 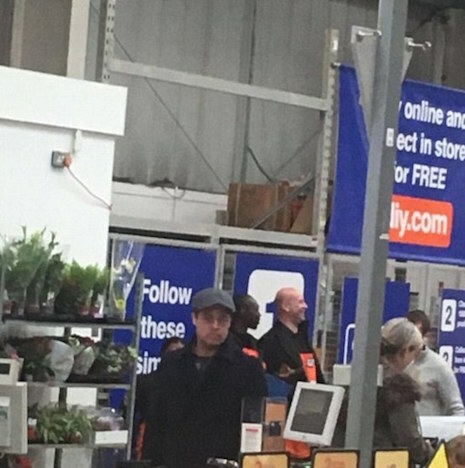 He visited the English version of Home Depot (called B&Q) to pick up some items with two of his kids. A few store employees spotted him in his newsboy cap and one posted a blurry photo on Twitter. Another remarked that his kids were very polite. No surprise there. ………….they wont sell bikes, so kids may be jobless now. He’s looking for a job?